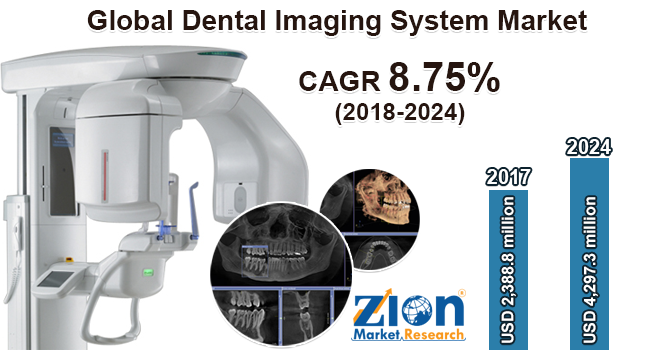 Zion Market Research has published a new report titled “Dental Imaging System Market by Dental Imaging Device Type (2D and 3D Imaging System), Product Type (Intraoral and Extra Oral Radiography System) and by End Users (Dental Clinics & Laboratories, Hospitals, and Dental Institutes): Global Industry Perspective, Comprehensive Analysis, and Forecast, 2018 - 2024”. According to the report, the global dental imaging system market was valued at approximately USD 2,388.8 million in 2017 and is expected to generate revenue of around 4,297.3 million by the end of 2024, growing at the CAGR of around 8.75% between 2018 and 2024. Dental imaging systems are those systems that are used to get the complete visual image of the oral cavity to detect the presence of any dental problem. There are various dental problems observed in the people of all age groups which can be easily detected by the help of these systems at the early stage. This helps to reduce the damage caused by the disease. These devices comprise small camera to reach the internal corners of the oral cavity and screen to get the visual image. This image is observed by the healthcare professional to understand the condition of the patient and which helps them to decide on an effective treatment for the patient according to condition and severity of the disease. Owing to the technological advancements, 3D imaging systems are preferred more by the professionals to get the 3D view of the oral cavity which makes them understand the anatomy more easily as compared to 2D imaging systems. Global dental imaging system market is primarily driven by the increase in dental problems/diseases and the growing demand for oral care. Other major driving factors are an increase in the awareness among people about oral care, technological advancements, government initiatives to increase the awareness, high disposable income, increase in geriatric population, increase in dental implants, and cosmetic surgeries are expected to increase the dental imaging system market. Strong regulations regarding X-ray exposure in few regions are the factors hindering the market growth but increase in the number of dentists, preference to digital systems, and the increase in the sale of 2D and 3D imaging systems are expected to support the growth of dental imaging system. The dental imaging system market is segmented on the basis of dental imaging device types such as 2D imaging system and 3D imaging system. 3D imaging system segment is expected to grow at the fastest rate in the global market over the forecast period. On the basis of product type, the market is segmented into intraoral radiography system and extraoral radiography system. Intraoral radiography system is expected to grow at the fastest rate over the forecast period. On the basis of end-user, the market is segmented into dental clinics & laboratories, hospitals, and dental institutes. Dental clinics and laboratories are the fastest growing segment in the dental imaging system over the forecast period. North America, Europe, Asia Pacific, Latin America, the Middle East & Africa are the key regional segments of global dental imaging system market. North America is anticipated to remain the leading region over the forecast period. The demand for dental imaging technology was highest in North American regions such as the U.S. Asia Pacific is expected to be the fastest growing region in the dental imaging system market during the forecast period. Furthermore, the Middle East & Africa and Latin America are expected to show considerable growth for the market in the near future. Some key players in dental imaging system market include Danaher Corporation, PlanmecaOy, Carestream Health, Midmark Corporation, Sirona Dental Systems Inc., Led Medical Diagnostic Inc., Imaging Sciences International Inc., and Flow Dental Corporation, among Others.